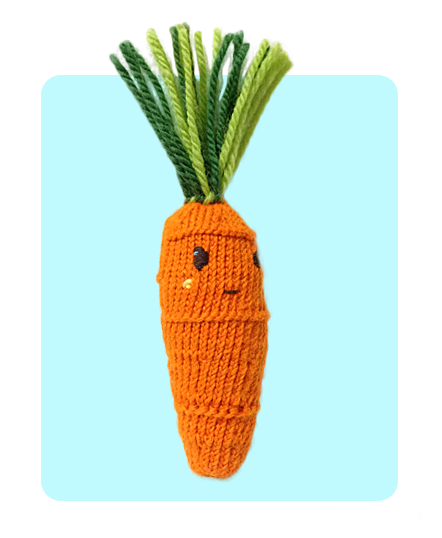 So, I did say I will create a friend for my Sweet Carrot and here he is! Ok, so what’s the difference? 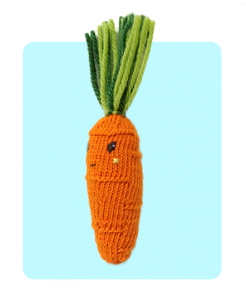 For the increase, Cool Carrot is knitted with M1 instead of Kfb. Since using slightly smaller needles for the yarn recommendation, I didn’t encounter problem with Kfb creating small holes. But with M1, you still get that slight indented surface and the same effect of carrot lines, but the surface is more smooth overall as Kfb stitches create bumps on the fabric. 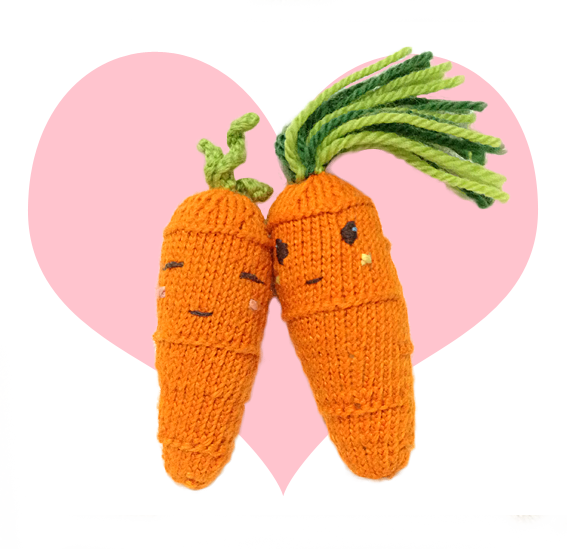 The patterns are interchangeable so you can pick which ones you like for making the carrot! And of course, you can’t miss that hair! 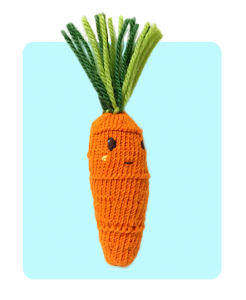 Cool Carrot has different tops and he gets foil highlight to make him looks trendy! Begin from the bottom of the body, CO 6 sts. Divide evenly to 3 DPN (2 sts each). Round 1: Join, K. Place a stitch marker after the first knit stitch. Cut yarn and leave approx 20cm tail. Now, I prefer to do the face embroidery before I close up the hole. If you don’t like having DPN needles as you are embroidering the face, you can transfer your stitches to stitch holders. 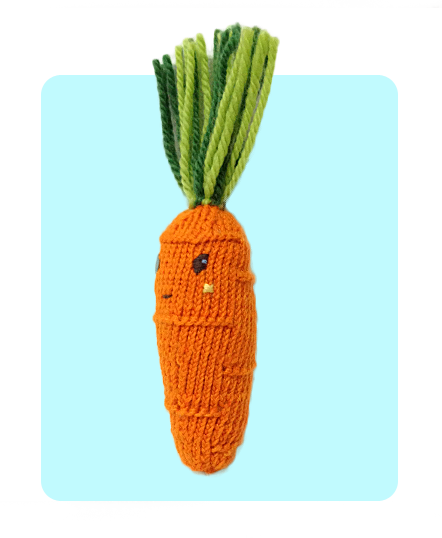 I use dark brown thread to match the colour of my Sweet Carrot. When you are done, stuffed the body with fillings of your choice. Do not close the hole yet. Now we will make the carrot greens. You should have 12 live stitches remaining in your DPN / stitch holders. 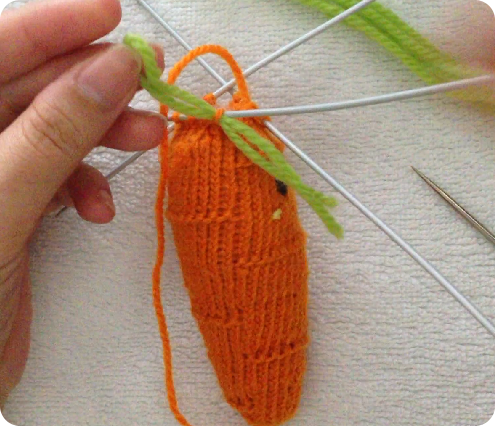 Use tapestry needle and thread a light green yarn into the first loop of your live stitch. Release the needle from the yarn. Grab the dark green yarn next and repeat the above 5 steps. Repeat this process while alternating between the light green and dark green yarn. 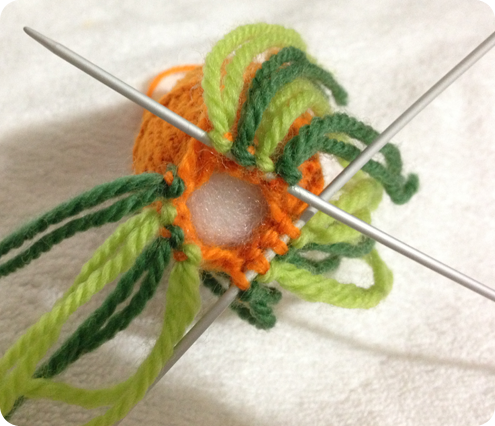 When you have finished adding the green yarn to the 12 live stitches, use a tapestry needle and thread the orange yarn through all the loop (now you can remove the stitch from the needles / stitch holders), pull the yarn tight and secure. You can also trim the hair to even things up at the end. I have also included a video below to help you, hopefully it all make sense! 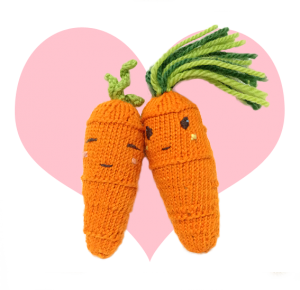 (DPN) double pointed needles, baby toys, carrot stuffed toys, cute amigurumi toys, easy knitting patterns, face embroidery, free knitting patterns, kid toys, knitted food, knitted toys. Bookmark.